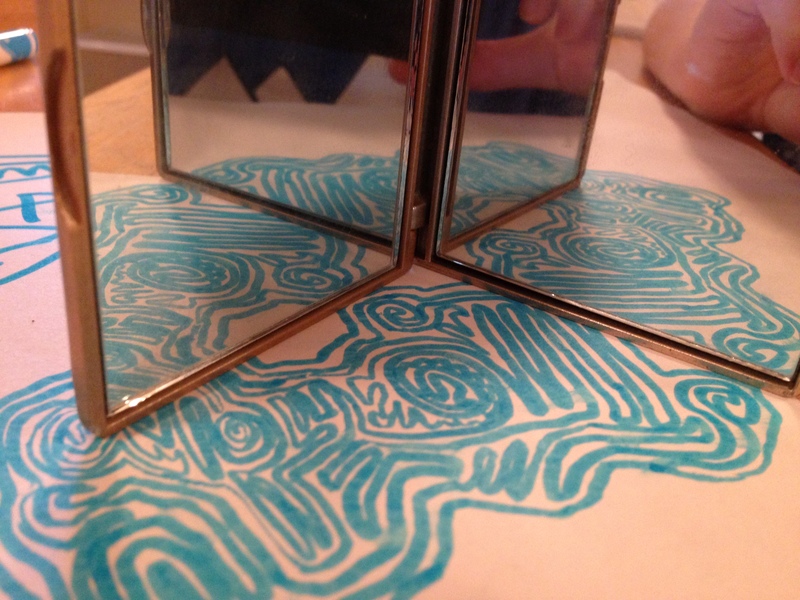 Draw a pattern on paper and use a hinged mirror to make multifaceted shapes with it. 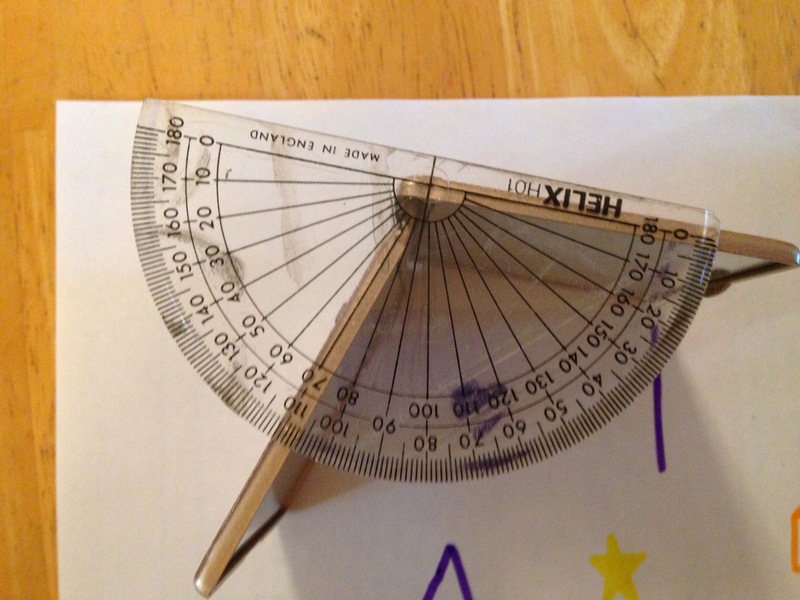 Older students can measure the angle between the mirrors and graph against the number of images. Use for exploring light and symmetrical shapes in nature. 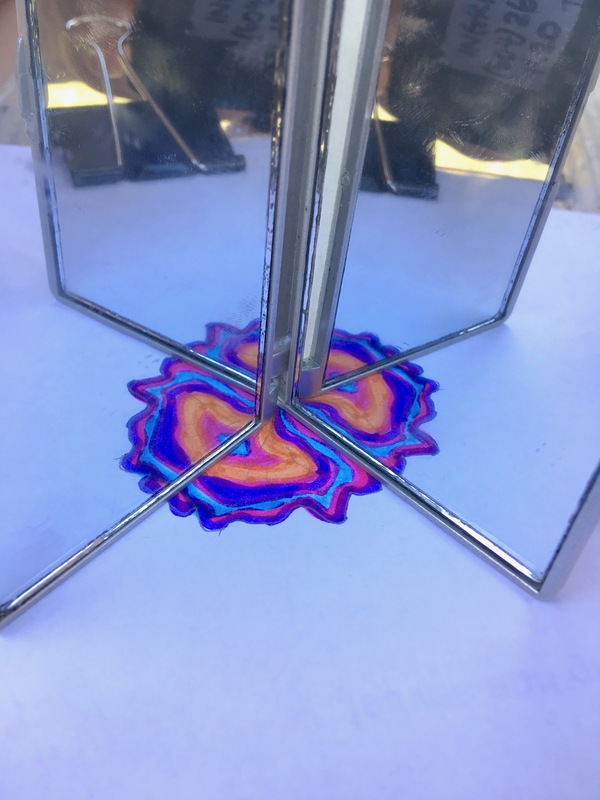 Students make a drawing on a piece of paper and lay it under the angled mirrors so that a symmetrical shape is made by the mirrors. By changing how far apart the mirrors are, the number of images in the mirrors changes. Also try looking at your face, or other objects, in the mirrors, and changing the angles. 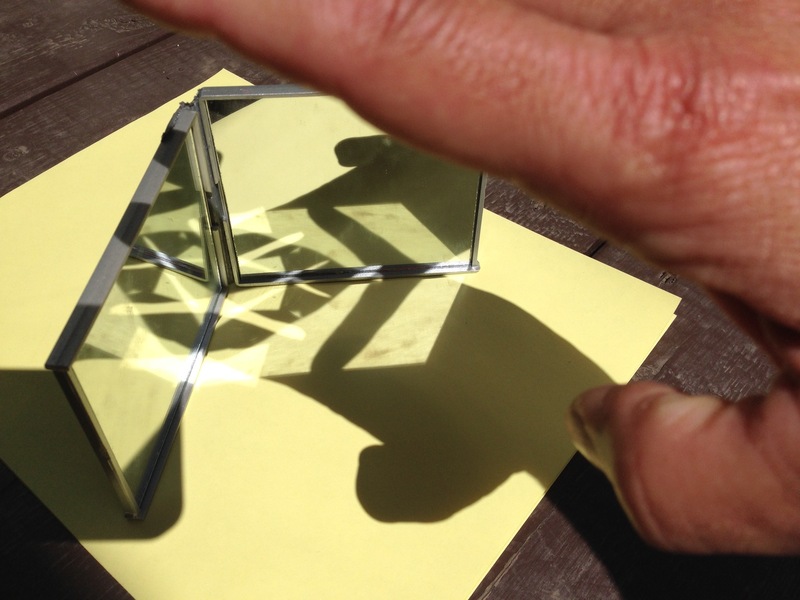 Allow students to explore, then discuss with them the principles of light that they are observing: Some objects are visible because they reflect light. Light travels in straight lines. Light can be reflected multiples times. To see an object, light from it must come into our eyes. Ask students to make a six pointed star, like a snowflake. Change the decorations on the point to make differently-shaped snowflakes, but they all have six points. 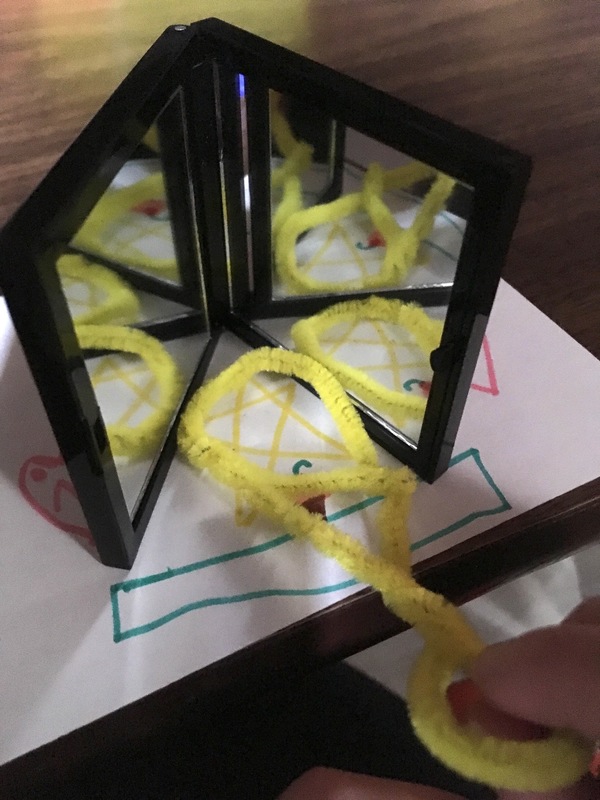 By changing the angle between the hinged mirrors, students make symmetrical shapes with different orders of symmetry. 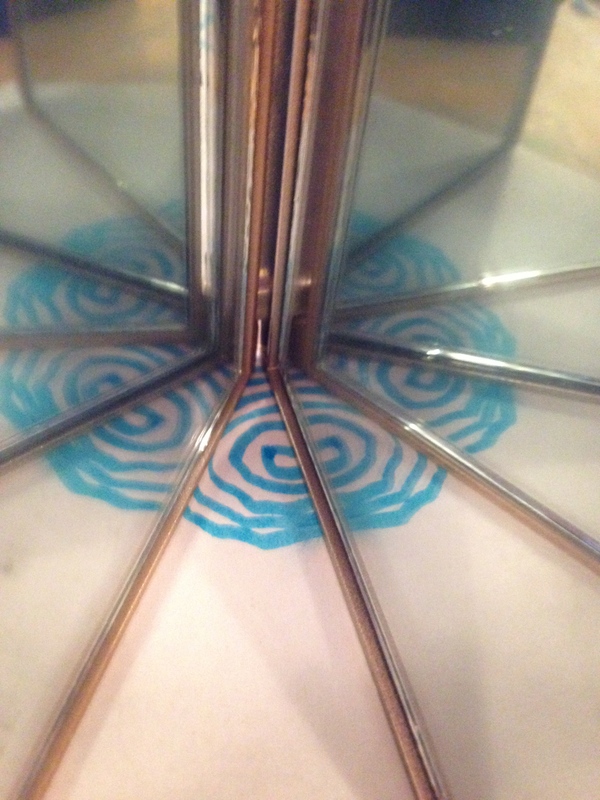 The angle between the mirrors determines the number of images. 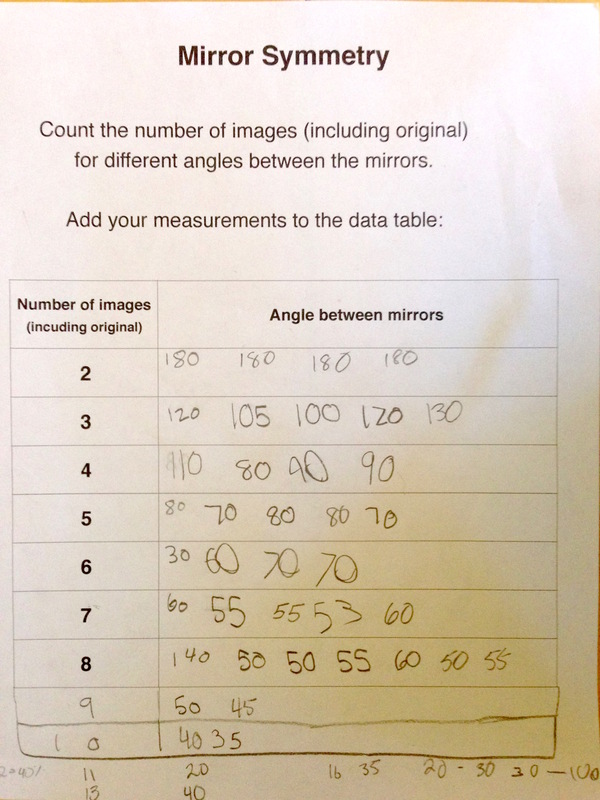 Ask students to record the the number of images (including the original) and the corresponding angle, to fill in the Mirror Symmetry data sheet. When the data is plotted on a class graph it will show an inverse relationship between the number of images and angle. The product of the angle and the number of images should be roughly 360, though there will be some deviation from this ideal with the class data (as is true for any real data). Discussion: The polyhedrons of crystal shapes also have rotational symmetry e.g. a cube has four orders of symmetry and a hexagonal prism has six orders of symmetry. Refer to real crystal shapes already encountered. Plot the class data on a graph. It will show an inverse relationship between the number of images and angle. The product of the angle and the number of images should be roughly 360, though there will be some deviation from this ideal with the class data (as is true for any real data). Crystals have rotational symmetry, so have the same relationship between the number of faces and the angles between them. As crystals are built up from units in a regular ordered way, for each type of crystal the angles between faces are always the same. Sometimes, one or more faces of a crystal grows larger than other faces, so that the overall crystal shape is not as regular, but the angles between the faces still remain constant. 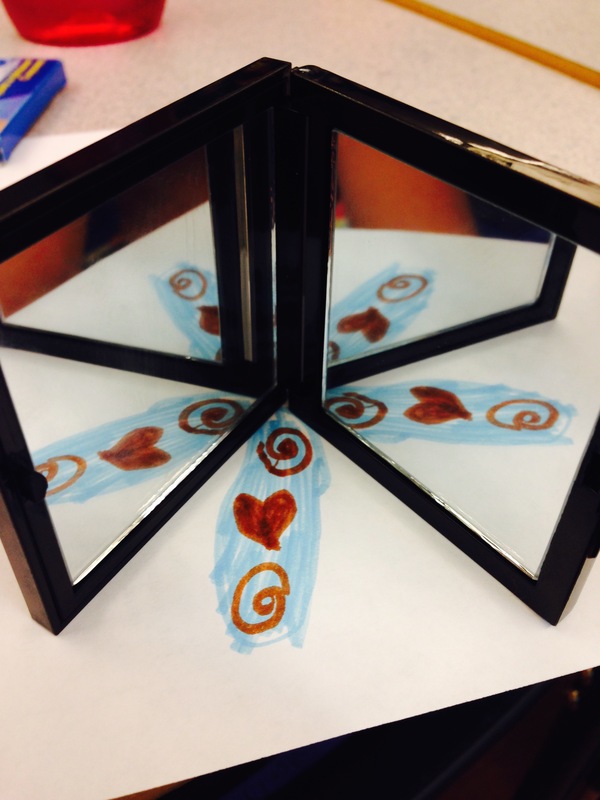 Students draw one petal and draw a pattern on it, then use the mirrors to make it into a multi-petal flower. They can look at real nectar guides, and modify their patterns to try and duplicate them. 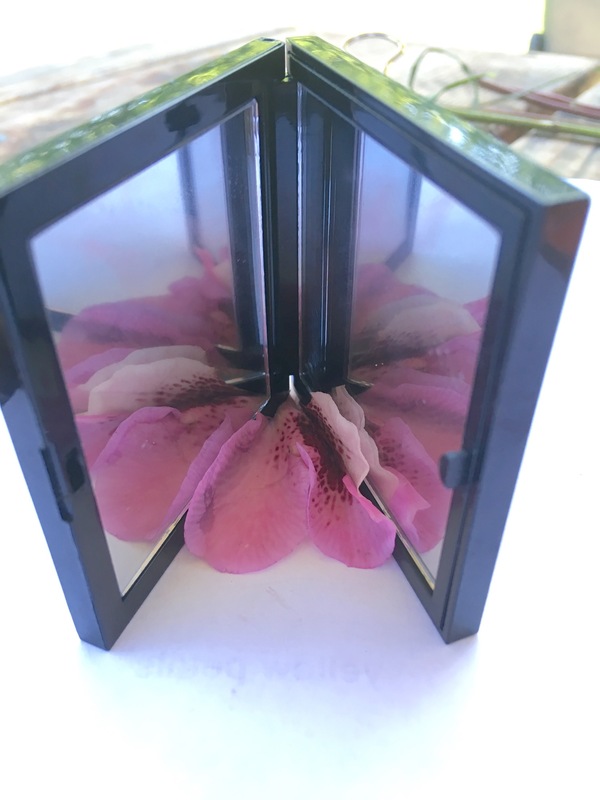 One petal with nectar guides can be placed between the mirrors to create a flower with nectar guides leading to its centre. From Mirrors book (resource), p.14. 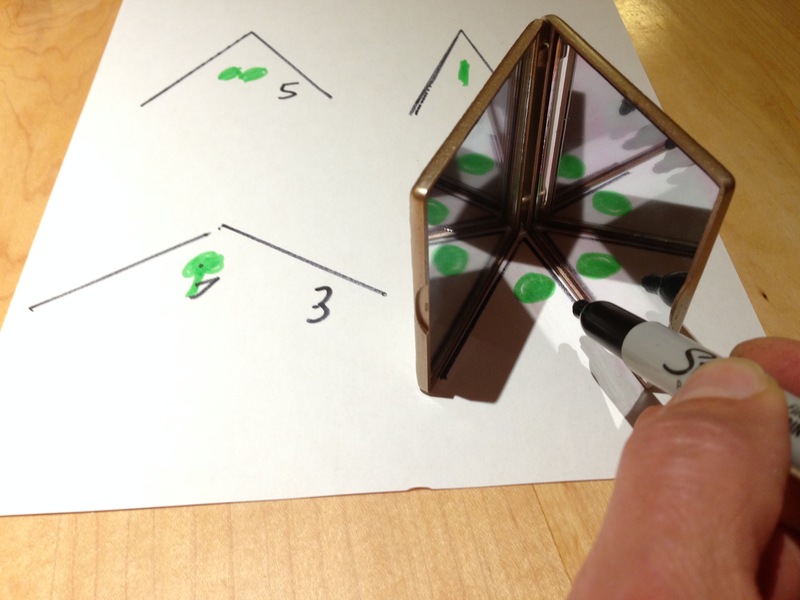 Use the sun or flashlight to make a shadow kaleidoscope.